Governments around the world are exploring various ways of improving energy efficiency and security during prolonged power-cuts. This has created lucrative prospects for the smart gas meter manufacturers. As per Transparency Market Research (TMR), the market is also likely to gain impetus from the favorable policies drafted in various nations to curb the carbon footprint. Furthermore, smart gas meters offer end users greater control over their electricity consumption and bills. Spurred by these factors, the global smart gas market is expected to report a CAGR of 32.2% between 2015 and 2023. Despite witnessing promising growth opportunities, the high initial investment required for installing smart gas meters limits the market’s trajectory to an extent. Nevertheless, the rising energy demand in Asia Pacific is likely to boost opportunities for the market in the near future. As per TMR, the global smart gas market stood at US$944.67 mn in 2014. The market is expected to reach US$10.5 bn by the end of 2023. The global smart gas market is segmented into residential, commercial, and industrial sectors. Of these, the market is currently dominated by the residential segment, which held approximately 73.85% of the market in 2014. As compared to commercial users, the consumers in the residential segment pay lesser for installation of smart gas meters. This is one of the key factors leading to the widespread deployment of smart gas meter across the residential sector. However, during the course of the forecast period, several regulations are likely to be implemented, obligating the installation of smart gas meters across the commercial and industrial segment. Installing smart gas meters enable energy savings by providing the ability to control gas usage. This is a primary factor that will boost the deployment of smart gas in the industrial and commercial segment. Regionally, North America leads the global smart gas market. Based on revenue, it held over 54.41% of the global smart gas market in 2014. However, as per TMR, the deployment of smart gas meters is slowing down in the region as compared to considerable roll outs of smart gas meters in countries such as China. Given the speed at which the developing economies are upgrading their transmission and distribution systems, and generating capabilities, they will very soon match the growth exhibited by the smart gas market across developed regions. In North America, Canada, Mexico, and the U.S. are currently exhibiting the highest demand for smart gas meters. In Europe smart metering initiatives are propelled by the increasing investments by the governments of Italy, France, and the U.K. The member nations of the European Union, as per a recent mandate, are required to deliver smart gas meters to almost 80% of their gas consumers by the end of 2020. Such regulations are expected to augur well for the future of the smart gas market. However, during the forecast period, Asia Pacific is expected to emerge as one of the most dynamic markets for smart gas meters. The commencement of various large-scale smart gas metering projects in countries such as China and Japan will fuel demand from the region. With utilities and governments in Asia Pacific encouraging aggressive smart gas meter deployments, the smart gas market in the region is expected to expand at a robust pace. Some of the leading players operating in the smart gas market include Itron, Inc., Elster Group GmbH, General Electric, EnerNOC Inc., and Sensus Metering Systems, Inc. This research study analyzes the market for smart gas in terms of revenue (USD Million) and volume (Million Units). The smart gas market has been segmented on the basis of technology, end-user, and geography. The regional segment has been further divided into five sub-segments that comprise eleven countries, which are major players in the global smart gas market. For the research, 2014 has been taken as the base year, while all forecasts have been given for the period from 2015 to 2023. Market data for all the segments has been provided at the regional as well as country-specific level from 2015 to 2023. The report provides a broad competitive analysis of companies engaged in the smart gas business. The report also includes the key market dynamics such as drivers, restraints, and opportunities affecting the global smart gas market. These market dynamics were analyzed in detail and are illustrated in the report with the help of supporting graphs and tables. The report also provides a comprehensive analysis of the global smart gas market with the help of Porter’s Five Forces model. This analysis helps in understanding the five major forces that affect the market structure and market profitability. The forces analyzed are bargaining power of buyers, bargaining power of suppliers, threat of new entrants, threat of substitutes, and degree of competition. The high-level analysis in the report provides detailed insights into the smart gas business globally. There are currently numerous drivers of the market. One of the most prominent drivers is the need to reduce carbon footprint and increase energy security of various economies. Market attractiveness analysis was carried out for the smart gas market on the basis of geography. Market attractiveness was estimated on the basis of common parameters that directly impact the market in different regions. The smart gas market was segmented on the basis of technology (meter data management (MDM), supervisory control and data acquisition (SCADA), geographic information system (GIS), and others) and end-users (residential and commercial & industrial). A smart gas meter varies according to the engineering and quality of components used in manufacturing. The smart gas market was analyzed across five geographies: North America, Asia Pacific, Europe, and Middle East and Africa, and South and Central America. Regional data has been provided for each sub-segment of the smart gas market. 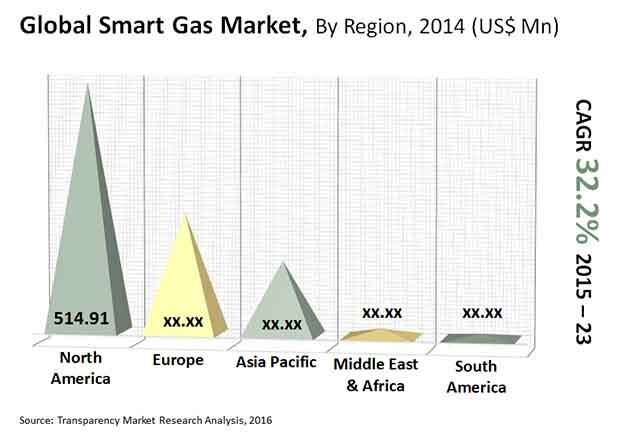 Key players in the smart gas market include ABB Group, Advanced MRF LLC, Badger Meter Inc., Capgemini S.A., CGI Group Inc., Comverge Inc., Cyan Technology Ltd., Elster Group GmbH, Itron Inc., EnerNOC Inc., General Electric, Master Meter Inc., MOXA Inc., Pacific Gas & Electric Company, Quadlogic Meters Canada Inc. (QMC), Schneider Electric SE, Sensus Metering Systems Inc., Silver Spring Networks, SmartGAS Mikrosensorik GmbH, Southern California Gas Company, Spire Metering Technology. The report provides an overview of these companies, followed by their financial details, business strategies, and recent developments.